Good evening, grandchildren. Please have a seat by the fireplace and make yourself comfortable. Does everyone have their Snuggies® and hot chocolate? Wonderful. By the way, I’m sorry to hear that your parents are getting divorced. "Where can I read more fables?" In a fantastic new book currently being written by Ryan Shattuck, called Moderately Important Fables. 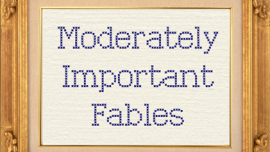 "What is Moderately Important Fables about?" Ryan Shattuck -- an author you’ve never heard of but who probably exists -- spent 57 years visiting every corner of the globe, collecting some of the most important fables in human history. He then organized these stories into a book called Moderately Important Fables, so that future generations might finally learn of the most life-changing fables ever recorded. 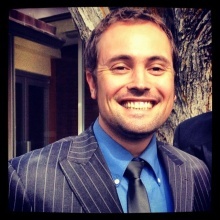 "Does Ryan Shattuck plan on publishing Moderately Important Fables?" Yes, eventually. Ryan Shattuck owes the city of Ann Arbor a substantial amount of money, due to the fact that he wildly underestimated how expensive it would be to keep hundreds of feral cats in his basement. "Why are my parents getting a divorce?"